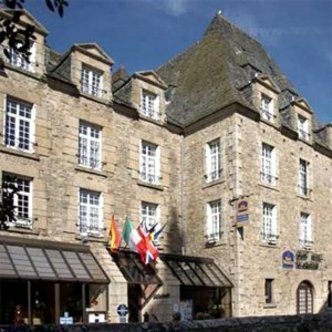 The Best Western Grand Hotel Talabardon occupies a beautiful and historic building that can be found just steps from the sea in Roscoff. The same family has run the property since 1890, so it’s safe to say that the operators probably know how to take care of their lodging guests. In addition to reliable service, guests of the Best Western Grand Hotel can expect to enjoy a good array of in-room amenities. The hotel also offers a variety of facilities, including a panoramic restaurant that specializes in seafood. While not overly luxurious, the 37 rooms at the Best Western Grand Hotel Talabardon are clean, comfortable, and well-equipped. Cable TV with some English-speaking channels, free internet access, and a coffee/tea maker are just some of the standard amenities. Some rooms offer views of the sea for those who are interested, and there is also one suite that offers extra space. Outside of the rooms, the Best Western Grand Hotel Talabardon offers the aforementioned seafood restaurant. Complementing this delightful eatery is a cocktail lounge. The facilities don’t end there, and the hotel also offers a range of services. Examples of the available services include fax and conference services. It should also be noted that guests of the Best Western Grand Hotel Talabardon can treat themselves to a full breakfast for a nominal fee.